Enjoy the best adapters for a great price! 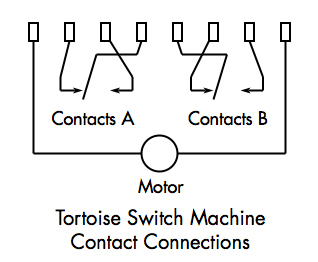 Connect Tortoise switch machines to our Touch Control System or any other without solder! 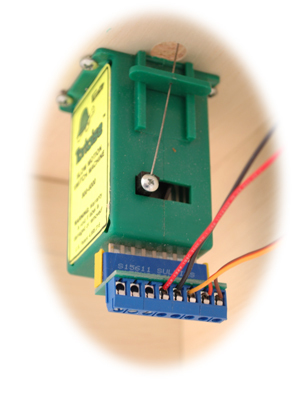 Stripped wires from 14 gauge to 22 gauge firmly connect with just a screwdriver to wire-clamping screw terminal connections. A sturdy socket with gold plated slide-on contacts pushes easily onto the Tortoise PC board. Our sockets are provided with the correct with slot width to ensure a snug centered placement on the Tortoise contacts with no “slop”. Although new sockets are provided with narrower slots, our Custom Snap-in Socket Spacers are also available separately for folks who already own the original pre-2017 wide-slot blue Sullins sockets. 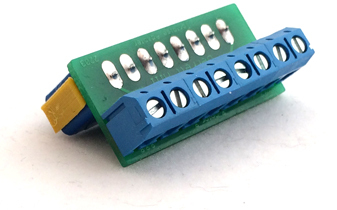 Adapters come with contacts for all eight wire connections, with terminals for the Tortoise motor and on-board switch contacts. Our motor connections are at the center of the terminal strips. Our switch contacts are the outer three contacts on either side. 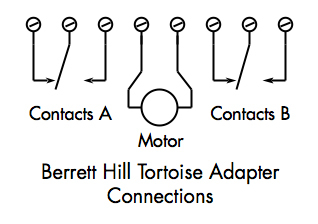 In our adapters, the common contact is in the center of each group of three. The left contacts are to the left and the right contacts are on the right. This order seems neater, easier to remember, and makes them consistent with the terminal order of our other products.